I just found out about this site called ActionAllStars.com yesterday. It's a free site where kids can create their own athlete and play all kinds of fun games. It's a sports themed virtual world, and it's designed for kids ages 6-14. I signed up for my own free account because it looked like fun, and because this is probably more my speed than some games designed for grown ups. And then, in order to register, kids must enter their parent's email address - or have the parent do it for them. Before the account can be activated, the parent is sent an email and must click a link agreeing to let their child join the Action AllStars site. The parent is also invited to create a parent account that will enable them to supervise and control their child's ActionAllStars.com experience. Along with playing the fun games, kids can also chat with each other on the site. There are two choices for chat - Safe Chat and Safe Chat Plus. Safe Chat allows athletes to send messages to each other, but each message is filtered to block inappropriate phrases and personal information. Safe Chat Plus allows athletes to communicate using a list of predefined choices. Parents can change the settings at any time through the parent account. I haven't tried the chat features yet, but I have had several other athletes add me as a buddy and trade cards with me. Some of the games are basketball, baseball, football and snowboarding. I tried snowboarding. My athlete fell down a lot because I had no idea what I was doing, but I got some points and earned some tokens, which I think can be exchanged for additional clothing and accessories. Now, I'm getting ready to try basketball. Oops, it wasn't basketball. See, I really don't know what I'm doing, but it is fun to explore. 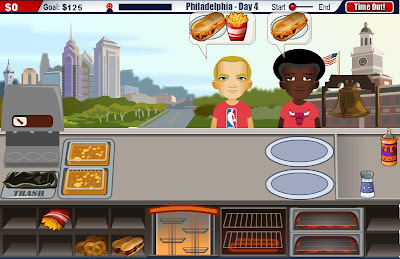 The game I found was running the snack bar for an NBA game. (One of the current partners of ActionAllStars.com is NBA.com.) The snack bar is fun, but tough. All these customers come in and place their orders, and I was doing OK until they all started coming at once! I'm going to keep trying. If you've got a kid who likes to play sports or any kinds of games, check out Action AllStars with them. It's Fun, Safe, and Free! Now, I'm going to go see if I can get those orders right.